I, too, spaced the dates. I will have to make a quickie post when I get home from work this evening. I love the green goddess!! Wow! hello dear, me too confused..now going to mark the date..my mind is spinning like always..lol.. I like Dark Alphabet, i've never seen that pattern before. I've never seen Dark Alphabet before, either, but it is really neat. Your Green Goddess is looking just lovely! Jo, the Green Goddess is wonderful - how great to see her back out again! The little flag next to your "Life's a Stitch" is simply adorable!!! Did you make that? GG looks great, Jo! Great plan on waiting on her face, just in case. Yeah, I'm an OOATer too, drives me insane to have multiple things going at once. As a result, my WIPocalypse posts are going to be kinda boring, hehehe. Green Goddess looks awesome!! What an amazing chart. Can't wait to see more of her. Good choice to wait until you have all the skeins for the skin. I had a batch difference on the Fragile Heart chart on her face which caused some frogging and then a (gulp) massive hole in the fabby, which ultimately led to a restart! I'm a OAAT girl as well so know where you are coming from. Green Goddess is gorgeous, it will be a very nice finish. Green Goddess is an intriguing piece, will be watching your progress on that one. Pretty pieces, and I'm soooo in love with how your dark alphabet is turning out! Such beautiful WIPs - seeing your Dark Alphabet is always a treat! 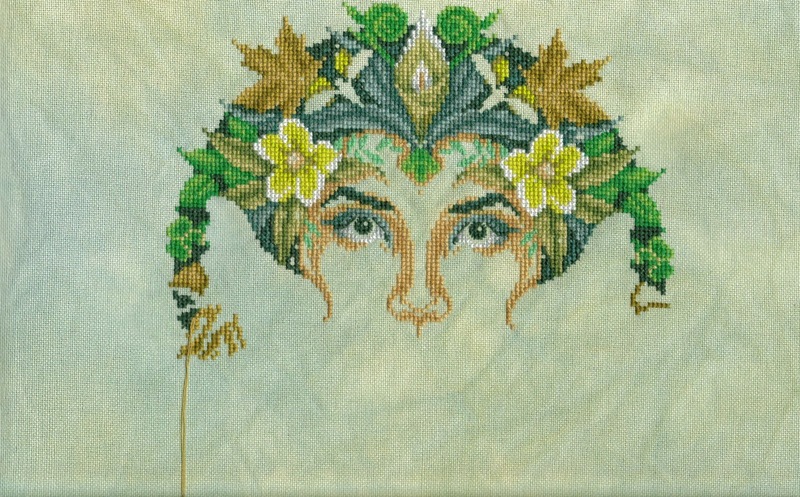 I stitched the Green Goddess last year and loved it, there's a picture on my blog. There are more OAATers than I thought, that's me at heart too. I really love the Dark Alphabet it is so different. Love all of these projects. 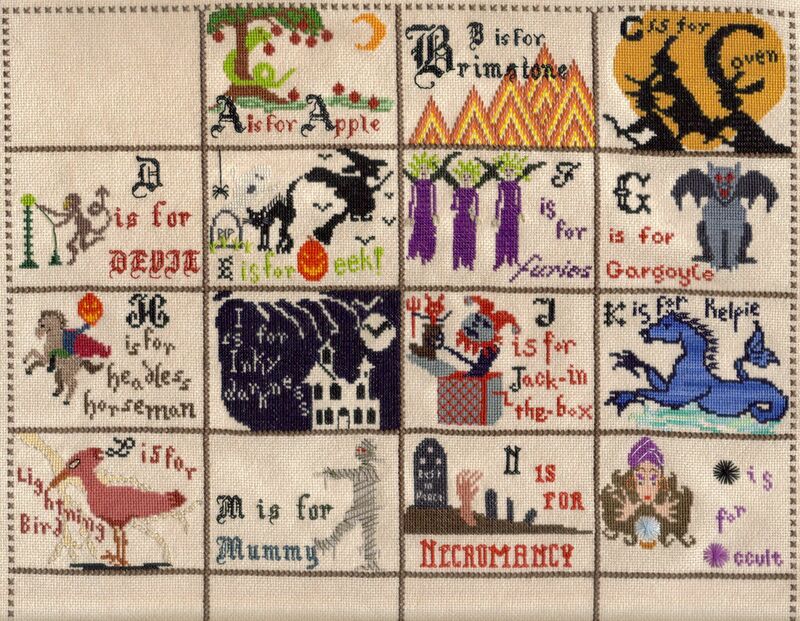 Can't wait to see your progress on all of them, but especially the Dark alphabet :D Have fun stitching! Gorgeous work so far, Jo! :) All three of your projects are on my "one of these days" list. And no worries not knowing where I am in the US - Rhode Island's only 30 by 40 miles in size. People in the US can't find us either. We barely show up on the map! For reference, I live roughly 60 miles south of Boston, Massachusetts. The Godess is turning out so nice! I signed up for both SALs as well, and at first didn't catch the different moon dates. Love your Dark Alphabet! I've been downloading them, but haven't stitched any yet. Good to see some pictures of Madame Flossie. Has she been a good houseguest? GG looks stunning!! so do the others!! great progress. I had seen the Dark Alphabet and was really tempted but I wasn't thrilled with all of the letters. I might stitch a letter I like though for something else. But I have sooo much Halloween! You have some wonderful looking projects on the go. I look forward to seeing your progress. I have join so many things this year that I currently setting up a ledger to remind me when & where to post everything. Yup - I had to go through and mark my google calendar so it pops up on my phone when the dates come up, otherwise I'd completely forget! Love your stitching :) Looks beautiful! Three very nice projects! And I love your statement at the top of your blog. A good reminder to take time to enjoy! Wow that wip is amazing!!! Oooh, I love all of your WIPs! I think yours is the first Dark Alphabet that I've seen all together--it's lovely! In the US, there used to be a salad dressing called Green Goddess that my parents would let us get as a treat every now on then. Not often, because my brothers & I loved it so much that we'd try eating it with a spoon. LOL Your Green Goddess is much lovelier than salad dressing, of course! ;) Fun memory, though! Jo, all your projects look great. Wonderful progress. Love the Green Goddess and looking forward to watching your progress on that one. Rhode Island? Well as someone once asked me when I lived in New Hampshire, "Oh is that a county in New England?" And that was from someone from the US. Sad statement on our geography lessons.